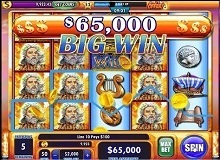 Greek gods have always been at the centre of the slot universe. Many developers over the years have tried putting their own rendition forward showcasing similarly themed slots for gamblers. When it comes to mythologies, there is no better one than Greek fables and the gods worshipped by the people of that time. There are many gods in the Greek culture, each with their own significance and particular powers who were responsible for looking after their people. One of the most notable gods in Greek mythology is Zeus who is also said to be the all father and rule of Mount Olympus. Zeus is often called the god of lightning who rules all the gods of Mount Olympus. He is said to be the controller of weather known for causing disruptions in the form of rain and storms. 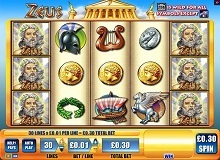 Zeus slot has been made by WMS Gaming known for their unique slot offerings. The game background seems to be a rendition of Mount Olympus itself with clear blue skies. The music score also seems to complement the slot quite well. As for symbols, there are many within the title including Zeus himself, his ride Pegasus, a boat, wreath, harp, a silver and gold coin, vase and helmet. Scatters: The lightning bolt symbol is the scatters within Zeus. Wilds: The Acropolis is the wild symbol here and is capable of substituting for all the other symbols within the slot except for bonuses and scatters. 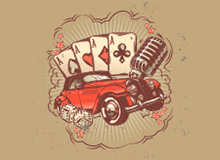 Free spins round: Getting three or more of the lightning bolt symbol anywhere on the reels trigger this feature. Three, four and five scatters will trigger 10, 25 and 100 free spins respectively. Stacked wilds: The stacked wilds symbol also appears within the production during the free spins round. This can increase your earnings significantly if a player manages to get three or more of the Zeus free hand symbol anywhere on the reels. Gamble feature: There is also a gamble feature present within the title. All you need to do here is pick the right colour card between black and red to double your winnings. If you choose the losing card, you will also stand to lose all your money up until that moment. 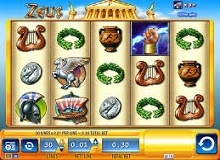 One can play Zeus slot machine online on different devices. The presence of HTML5 technology in casinos online is helping gamblers cause where they can log in via any medium including mobile, desktop, tablet or Blackberry and still be able to play their favourite slot. A practical strategy to play Zeus game is to keep your wagering limited and concentrate on the free spins feature as well as the stacked wilds as it can significantly increase your earnings within the production. There are no hidden rules or cheats when it comes to earning big here. The production has an RTP rate of 95.97%. Gamblers can play Zeus for real money on different online casinos today. The last decade has brought about an increase in the number of online casinos significantly. For high rollers, this is a title they pay big money wins handsomely provided you play your hand in a proper way. One other thing to note about Zeus is that there can be changes in the payout percentages of different casinos due to a number of different combination settings. It bodes well to check in advance with your portal regarding the same. If you are someone who loves ancient mythologies, then this is one slot that you should definitely not miss.